Battle Honours awarded to HM ships and Fleet Air Arm squadrons are intended to foster esprit de corps among the ships companies and so take a personal interest in the wartime exploits of their ships and past ships of the same name. They are recommended by the Battle Honours Committee to the Navy Board. Battle Honours are awarded for successful war service, not just a record of service. 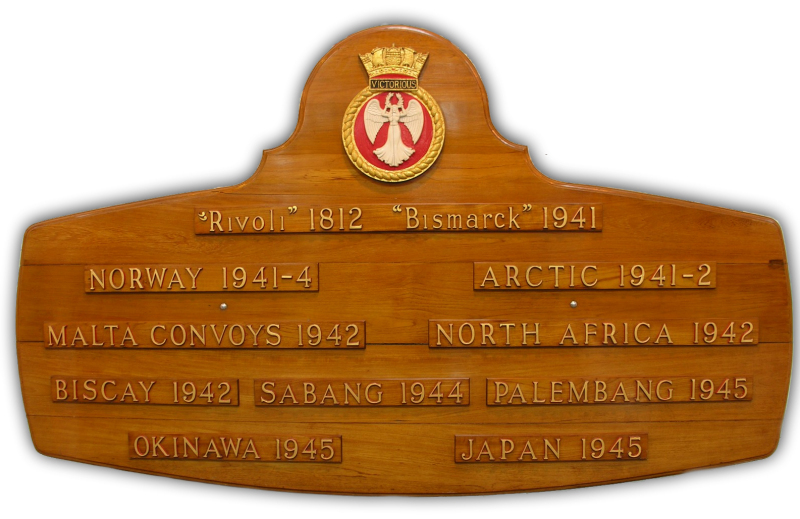 As warships do not carry regimental colours, battle honours are instead displayed on a battle honour board. This is usually a solid wooden board (traditionally teak) mounted on the ship's superstructure, carved with the ship's badge and scrolls naming the ship and the associated honours, and either left completely unpainted, or with the lettering painted gold. The actions and campaigns listed as Battle Honours are displayed on a scroll, mounted in a suitable position in the ships which are eligible for the Honours. Battle Honours are normally shown in BLOCK LETTERS, with Single-ship and Boat Service actions listed in lower case between inverted commas. This allows the distinction between a Fleet Action named after a place and a single ship of the same name. e.g. CHESAPEAKE 1781 and 'Chesapeake' 1813. Battle Honour Scrolls taken from ships being sold are stored for use in other ships of the same name. The first honour granted was for 'ARMADA 1588'. Honours are awarded for six types of action. Single-ship or Boat Service Actions.